Gov. Bruce Rauner is overhauling a key Medicaid program that's intended to rein in costs, but hasn't saved enough money and has drawn the ire of doctors and hospitals alike. Insurers will have to bid for a piece of the state's managed care program, which is projected to cost more than $9 billion in 2018, or nearly a quarter of Rauner's overall proposed $37.3 billion budget. He plans to narrow the number of carriers that now participate in managed care, possibly by more than half. "Since taking office in 2015, the Rauner administration has analyzed the managed care system and found serious flaws that need to be addressed," John Hoffman, a spokesman for the Illinois Department of Healthcare and Family Services, which oversees Medicaid, said in a statement. "A clear rate structure and measurable quality and care coordination metrics are needed to reduce confusion for care providers and beneficiaries and enhance financial efficiencies." Rauner has spent much of his roughly two years in office locking horns with the state Legislature trying to pass a budget. Restructuring managed care is among his biggest moves yet to restrain spending in Medicaid, a state-federal health insurance program for the poor and disabled. Rauner, a Republican, inherited the managed care program from his Democratic predecessor Pat Quinn, who backed a law placing half of all Medicaid recipients in managed care by 2015 to cut costs. Now, about 65 percent of Medicaid enrollees, or about 2 million people, are managed by one of 12 insurers contracted with the state. They include Blue Cross & Blue Shield of Illinois, the largest insurer in the state, and the Cook County Health & Hospitals System's CountyCare program. Overseeing patients can be a tedious and expensive endeavor, involving coordinators and social workers to help doctors make sure patients don't fall through the cracks, or misuse expensive services, such as showing up in the ER for a cold. Doctors and hospitals have complained about having to contract with so many insurers. Each has their own set of rules, creating a heavy administrative burden, and the providers are often paid late. That's partly because the state delays payments to the insurers. Rauner doesn't believe the managed care program has saved a significant amount of money, said Hoffman. But it's not clear how much money has been saved, and what Rauner's goal is. In 2011, Quinn estimated Medicaid reforms, including placing half of the state's Medicaid pool into managed care, would save up to $774 million over five years. 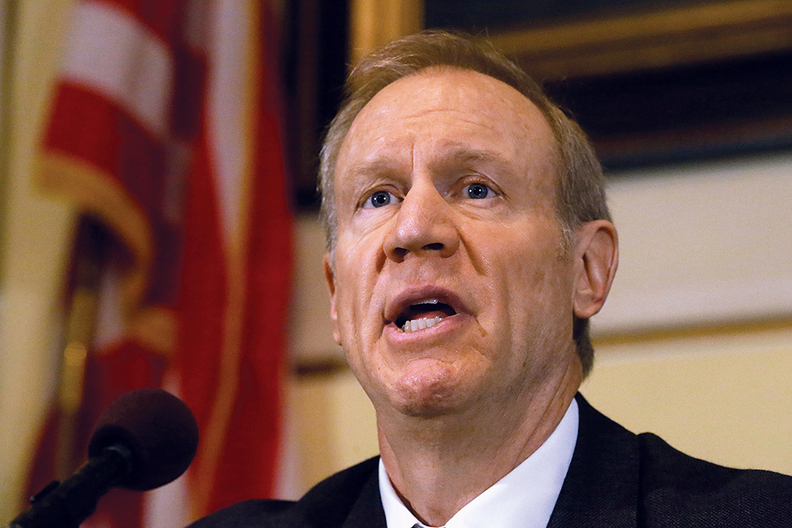 Rauner also wants better patient outcomes, and he aims to expand managed care statewide. Now it's just in five regions in Illinois. Samantha Olds Frey, Chicago-based executive director of the Illinois Association of Medicaid Health Plans, a lobbying group for insurers contracted with the state, said her members have a "shared goal of a high-quality and cost-effective program." When asked how much the health plans have saved the state, she said she's working on the analysis. But Frey noted several areas of improvement, such as reducing hospital readmissions and increasing the number of people who are taking their prescription drugs on time. Insurers did this while taking on a flood of new members as the state aggressively placed people into managed care, she said. Frey estimated insurers in the managed care program are paid a total of about $6 billion a year, which means the state is projected to pay more for the program in 2018. And if fewer insurers are expected to participate while managed care goes statewide, each insurer whose bids are accepted would take on even more enrollees. That means staffing up to meet the demands in a tight timeframe. The state plans to award up to seven contracts to begin on Jan. 1, 2018, Hoffman said. "Why Rauner's quest for Medicaid savings is a big deal" originally appeared In Crain's Chicago Business.